Senor Zuloaga’s paintings need no introduction, but we are happy to introduce the artist himself on his first visit to Boston. The group of forty of his most recent and important paintings is a magnificent and thoroughly comprehensive demonstration of the genius of the greatest Spanish painter of modern times. One feels the influence of El Greco and Velasquez in an Art thoroughly modern, breathing the spirit of Spain, depicting her Cities and Landscape, her Nobility, Bull-fighters, Beggars and Vampires with a brilliance, power and passion which is awe-inspiring. We are greatly indebted to Governor Fuller for the loan of his three splendid examples, which alone would make an exhibit of much importance. Few people today would recognize the name of Spanish painter Ignacio Zuloaga (1870-1945). Yet in his 1925 show at Vose Galleries, over 22,000 devotees viewed the exhibition, a record for attendance that still stands. 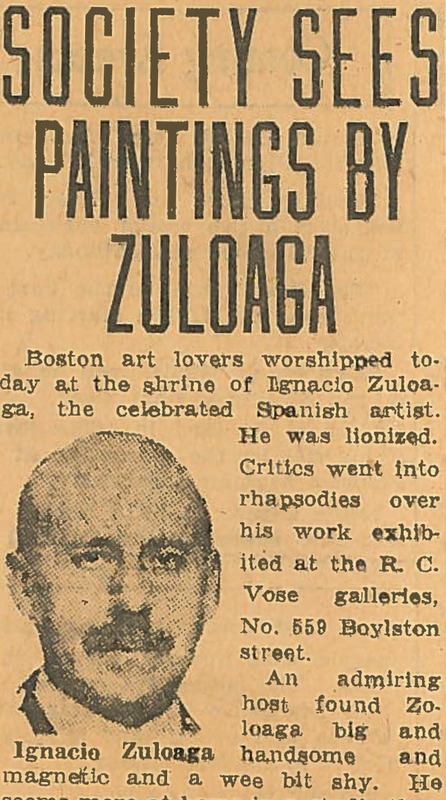 "The excitement of this week will be the opening at the Vose Gallery of the large exhibition of paintings by Zuloaga, admirable and admired painter" proclaimed the Boston Herald. "To have secured the Zuloagas is an achievement upon which Mr. Vose will long receive congratulations." Articles on Zuloaga appeared in the New York Times, New York Times Magazine, Town and Country, and International Studio. But his art did not endure, plunging into obscurity after the artist’s death. After a 1991 retrospective exhibition of his work, a reviewer in Connoisseur wondered "why this once important figure has been relegated to such minor status" and speculated that the painter was eclipsed by Modernism or that some of his works descended to "sheer kitsch". Others speculate that his personal magnetism was more a cause of his acclaim than his talent, or that his sensual nudes were a magnet for the huge crowds, or that romanticizing all things Spanish obscured critical evaluation. Ignacio Zuloaga - gifted artist or hypemaster? We can add only one maxim that has guided us for over 150 years: The popularity of an artist is as difficult to predict as the weather.